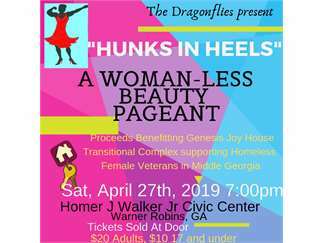 "Hunks in Heels" is a great way to give back! This is a woman-less beauty pageant that will be full of fun and laughter. Spread the word! We are seeking contestants and spoinsors. Contestants will compete in Casual Wear, Talent, Evening Gown and an Onstage Question. (Yes we are aware that you are a MAN, but in this woman-less pageant you will be competing as your best female character). We're seeking business and individual sponsors. •	Name mentioned each time your contestant takes the stage. •	Listed in program as the contestant's sponsor. •	A 1/4 page ad in the program. •	Two tickets to the event. •	Listed in program as a pageant sponsor. •	A "thank you" from the stage. People's Choice Award Winner - Audience can purchase votes for their favor contestant during the pageant. HELP US FILL 1,400 SEATS!